Hmmm… I’m feeling a bit lazy so I’ll just feed you with a few notes about the days and some photos. I think it shows quite well how busy the time has been. 03.06.: After two firings with the new kiln we had to admit that another one wouldn’t be possible without rebuilding the wooden frame that holds it all together. 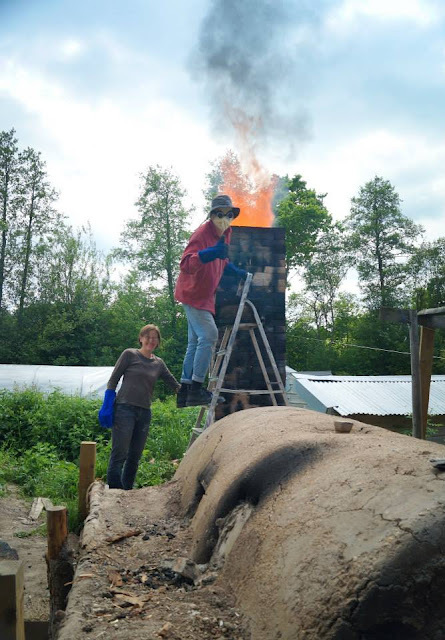 Too much of the timber caught fire the last time and we didn't want to risk a collapse of the kiln at 1300°C… So I take down the frame, extend it further out at either side and fill it up with cob. I find it quite fascinating, watching the kiln to grow more and more. 04. – 07.06.: This years’ first show! For Sabine’s demonstration stand at the Contemporary Craft festival in the nearby Bovey Tracey we have to move Nic’s kick wheel. For the last two weeks we have had Jana, a student from Landshut working with us. She helps Sabine most of the time in Bovey whilst I concentrate on my throwing, making mugs for Adopt a Potter. 25.06.: And we’re off to ‘Earth and Fire’ in Rufford, Nottinghamshire! We arrived with five hours delay at late night due to our hired van that broke down, then a sick dog and… who hasn’t heard the story!? 26.06.: setting up the stands in the morning just before the show opens and then for the rest of the day: pots, pots, conversations, pots, looking after the stands, shopping pots! 02.07.: Start of ‘Art in Clay’, Adopt a Potter has got a stand for a tombola. My duty is to collect donated pots from the exhibitors. Thank you very much for all the great donations and conversations! 03.07.: Tombola, Tombola! One ticket for 2 Pounds, 3 for just a fiver! You're having a go with it? Apply for adoption now and get a fully house trained potter! 05.07.: The day says hello at 5 am, taking down the yurt and shelter, packing the van. 7.30 am: I’ve missed your traffic jams, M25!